Its main characteristic are the inclined planes. 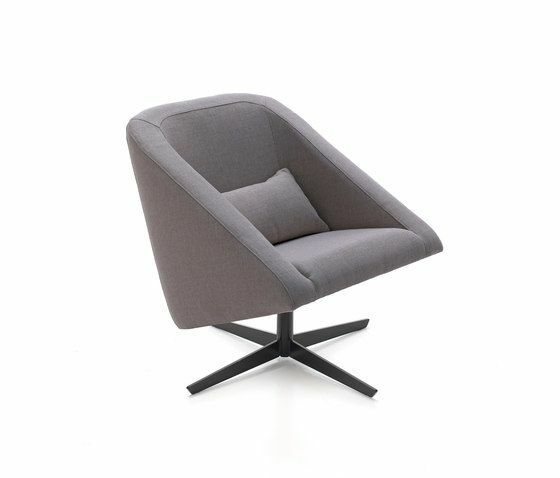 Arm, back and seat take one position, offering comfort, distinction and elegance. It is finished with a lumbar support cushion (50x27cm) for a better comfort in the lumbar area. MATERIALS: – Solid wood frame, covered with HRD 35 kg/m3 foam. Suspension made with Nea elastic webbing, guarantee of quality 10 years. – Seat cushion in HR 40 kg/m3 foam covered with thermo-sealed H250gr fibre. – Back in HR 35 kg/m3 foam covered with thermo-sealed H250gr fibre. Lumbar support cushion with cotton interior cover filled with padded microfiber down touch (Microgel). Base in polished stainless steel AISI 304. – Base, option to choose the swivel base in: stainless steel, epoxi lacquered metal.